MH 6-6 Signed LOI "Katie is a great natural blocker. She has the potential to become a strong front row player for us." The competition gets harder and harder. I don’t think it’s the pressure. What pressure will we have next year? We’ll have nine new freshmen coming into the program. Their pressure is to try and keep the program at as high a level as we possibly can. So when they lose a match, I’m not going to say “it’s your fault,” because the streak was made up of a lot of players that are gone. Certainly, there will be high hopes for The Nine (the incoming freshmen, not the United States Supreme Court). But it’s not as though they are unfamiliar with the limelight or big stage competition. were among the 24 high school volleyball players selected as First Team Under Armour Girls High School All-Americans (the next highest total for any school was two). The Under Armour Girls High School All-American Team also includes 24 Second Team All Americans, and 52 Honorable Mention All Americans (5-6 setter Alyssa Longo from Littleton Colorado was an Honorable Mention selection). The 100 athletes come from 27 states and 81 high schools. To be eligible for selection to the Under Armour Girls High School All-American Team, a student-athlete must be in her senior year of high school, be nominated by her high school coach (who must be a member of the AVCA), and have her season statistics entered by her coach into the MaxPreps database. * For the complete MaxPreps Under Armour Volleyball All American Q&A with Maddie Martin Click Here. *For the complete MaxPreps Under Armour Volleyball All American Q&A with Deja McClendon Click Here. *For the complete MaxPreps Under Armour Volleyball All American Q&A with Mckinzie Moydell Click Here. *For the complete MaxPreps Under Armour Volleyball All American Q&A with Ariel Scott Click Here. *For the complete MaxPreps Under Armour Volleyball All American Q&A with Katie Slay Click Here. For the complete listing of the 2009 Under Armour Volleyball All-Americans, including links to their Q&As, Click Here. 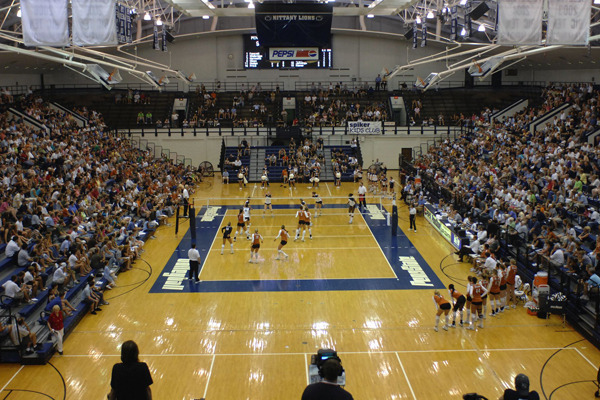 In addition to making the 2009 Under Armour Volleyball All American team, three of The Nine were selected as Gatorade/RISE State Players of the Year: Maddie Martin (Florida); Deja McClendon (Kentucky); and Ariel Scott (New Jersey). This year marks the 25th year in which the Gatorade Company (now in conjunction with ESPN RISE) has awarded State Volleyball Player of the Year honors to individual winners in all 50 states and District of Columbia. The award is for demonstrated achievement in volleyball and also for academic achievement and exemplary character, both on and off the court. For the complete list of State winners, Click Here. Tampa, FL, December 21, 2009. Plant outside hitter Maddie Martin watched from the stands with five future Penn State teammates — all of them Under Armour All-Americans — as the Nittany Lions rallied from two sets down to claim their record third straight national title Saturday night at the St. Pete Times Forum. She had been fighting illness last week, but part of the reason her voice was cracking hours later likely had to do with her screaming and cheering for her future team. And less than 24 hours later, Martin closed out a stellar high school career on the same court, earning MVP honors in the Under Armour All-American Match on Sunday afternoon. For the complete article, including photos of Under Armour All-Americans and future Penn Staters Maddie Martin, Ariel Scott, and Katie Slay, Click Here. By Kevin Askeland, MaxPreps.com, November 2, 2009. For her first two years playing volleyball at DuPont Manual High School in Louisville, Ky., Deja McClendon really had no idea just how good a player she was. That all changed on Sept. 1 of her junior year. McClendon, one of the top players in the state of Kentucky, has committed to play at Penn State next season. “I went through most of the recruiting process early in my junior year and it was really stressful to balance that and school,” said McClendon. “My parents helped me out so much by gathering research and helping me figure out what is important to me, which made it easier. The hardest part about it was not actually choosing but having to say no to coaches that I really liked. Click Here for some photos of Deja McClendon competing in 2008. Actually, it isn’t that time yet, but since there are so many student athletes at Chaparral High School making an official commitment to play sports and accept scholarships to the next level, the Wolverines had to make it that time again. Chaparral athletics honored six of its students for signing respective letters of intent to play for a post-secondary institution Nov. 11 at the school in Parker. Mikinzie Moydell, 17, is also no stranger to playing at a state championship level. She was a part of the Wolverines’ state contending team, the weekend after she signed her commitment to play the nets at Penn State University where she plans on studying wildlife biology. Her sophomore season, she was first team all-academic and second team all-conference. Moydell said, prior to the 2009 state championship tournament, that her favorite moment of high school volleyball was this season when Chaparral won the regional championship after being down against Ponderosa two games to none. “The energy and competition was a really high level, and the game was a blast to play in,” she said. By Brian A. Giuffra. This story appeared in the New Jersey edition of the October ESPN RISE Magazine. How did Ariel Scott do it? How did the Immaculate Heart Academy (Washington Township, N.J.) senior go from not being able to hit a volleyball over the net as a freshman to being called one of the best players in state history as a junior? If love were all it took, everyone who played volleyball could be as good as Scott. They could have the top college coaches in the nation scouting their practices. They could train with the U.S. Women’s Junior National Team. They could play for the top club volleyball team in New Jersey. By Tommy Kopetskie, NorthRaleighSports.com, November 30, 2009. If the Penn State University women’s volleyball team makes a run at its third consecutive national championship this December in Tampa, Fla. — a good chance considering the Lions have won 90-plus contests in a row — Wakefield senior and future Lady Lion Katie Slay will be there. But the title game won’t be the emphasis of the Lady Wolverine’s trip down south. In a press release last week, the American Volleyball Coaches Association (AVCA) announced the rosters for the fourth annual Under Armour Girls High School All-America Teams, and Slay earned first-team All-America honors.